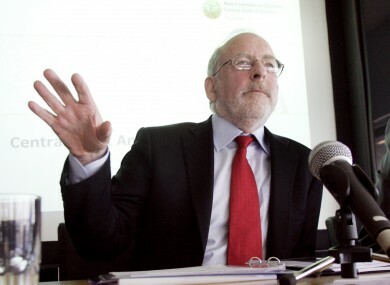 Finance committee demands Honohan meeting as "urgent priority"
The Oireachtas finance committee formally writes to Patrick Honohan asking for a meeting before the promissory note payment. Patrick Honohan had reportedly told TDs that while he would attending a meeting, he was not available to attend before the first promissory note repayment was due. THE ALL-PARTY Oireachtas committee on Finance, Public Expenditure and Reform has formally written to Central Bank governor Patrick Honohan asking for a meeting as an “urgent priority”. The request follows yesterday’s unusual events at the committee, where the government lost a vote on inviting Honohan to a hearing to discuss the Anglo Irish Bank promissory notes, which are due for their first repayment at the end of the month. In a formal letter signed by committee chairman Alex White of Labour, and seen by TheJournal.ie, the TDs ask for “an opportunity for the members of the Committee to engage with you on the ELA [Emergency Liquidity Assistance]/Promissory Note issue”. Please be advised that the members are anxious, as an urgent priority, to continue examination of these vital issues, and regard it as an essential element of this discussion that we would have the benefit of your input before the Committee. The letter concludes with a request that Honohan attend a meeting to be held before March 23 – essentially demanding a meeting next week when the Houses of the Oireachtas will be otherwise on their St Patrick’s Day recess. This morning government backbencher Liam Twomey said that while Honohan was seemingly willing to attend a committee hearing on the subject, he was not available to attend for the rest of March. A Central Bank spokesman declined to comment this morning on whether Honohan would make himself available for a meeting. The opposition members of the committee won the vote 11-9 when two Fine Gael members, Twomey and Kieran O’Donnell, left the room to fetch their party colleagues attending a meeting elsewhere – only then to be locked out of the room when the vote began without them. Email “Finance committee demands Honohan meeting as "urgent priority"”. Feedback on “Finance committee demands Honohan meeting as "urgent priority"”.